The St. Louis Cardinals enter Game 4 of the National League Division Series (NLDS) on the brink of elimination–down 2 games to 1 to the Pittsburgh Pirates. If the Cardinals win Game 4, both teams will return to St. Louis for Game 5, and Adam Wainwright will be primed and ready to go for the Cardinals. However, before this can happen, the Cardinals must win Game 4 first. Well, Mike Matheny has assigned this tall task to 22-year-old rookie right-hander, Michael Wacha, and this looks, at least on paper, to be an extremely wise decision. As I wrote in my post on September 25th, Wacha’s “1-2 punch” of fastball-changeup is a devastating combination and when it is on, it is nearly unhittable. Though he is still just a rookie, I would argue that he has one of the best changeups in all of baseball. According to BrooksBaseball’s PITCHf/x tool, Wacha has thrown 283 changeups in 2013, and the pitch is averaging 5.95 inches of horizontal movement (tailing action). This horizontal movement combined with the downward plane from his 6’6″ frame has led to the hitter swinging and missing on 22.61% of his changeups (aka whiff %). Also, batters are hitting line-drives off his changeup just 2.47% of the time (For perspective, both of these percentages are even better than changeup-specialist, Cliff Lee). So, Wacha has a good changeup…so what? As you can see from the table, the team as a whole has had 517 at-bats end on a changeup in 2013. The team is hitting less than .200 against changeups–coming in at .198. Also, of the 517 at-bats, 130 of them (25%) have been strikeouts. 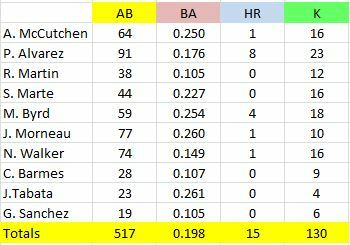 Lastly, the team is not hitting for much power against changeups this season–hitting 15 home runs or just 2.9% of their at-bats. I realize that playoff baseball is not played “on paper,” and there will be numerous variables that play a part in the outcome of Game 4. 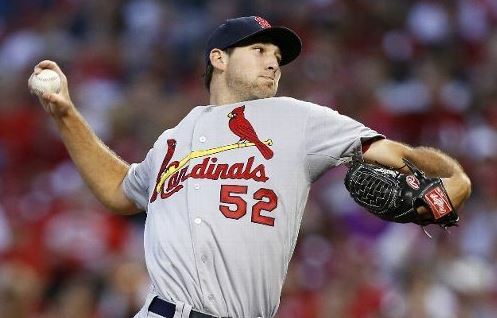 However, in my opinion, one that is backed up by the data above, Wacha is the best candidate to get the Cardinals back to St. Louis for Game 5. His fastball-changeup combination gives him a huge physical advantage over the Pittsburgh hitters, but will he be ready mentally for the task at hand? This is something we will soon find out. This entry was posted in Playoffs, St. Louis Cardinals and tagged Adam Wainwright, Michael Wacha, NLDS, Pittsburgh PIrates, St. Louis Cardinals by stlcupofjoe. Bookmark the permalink. Of course, you have to bump Alvarez and Martin up just because they would hit Cardinal changeups when they couldn’t hit anyone else’s. 🙂 I think the pitching matchup bodes well for a Game 5, but they’ve gotta go out and prove it! Here’s hoping! Pingback: Wacha Say Cards Play Game 5?